Gabriela Friðriksdóttir’s enigmatic artworks – which take the form of sculpture, animation, painting, drawing, live performance, dance and video­ – are a riposte to banality and rational thinking. In fact, it could be said, that in order to fully appreciate the Icelandic artist's vision, one must be open to subtle semiology, the complexity of deep-rooted human emotions and the possibility of worlds far beyond our own. 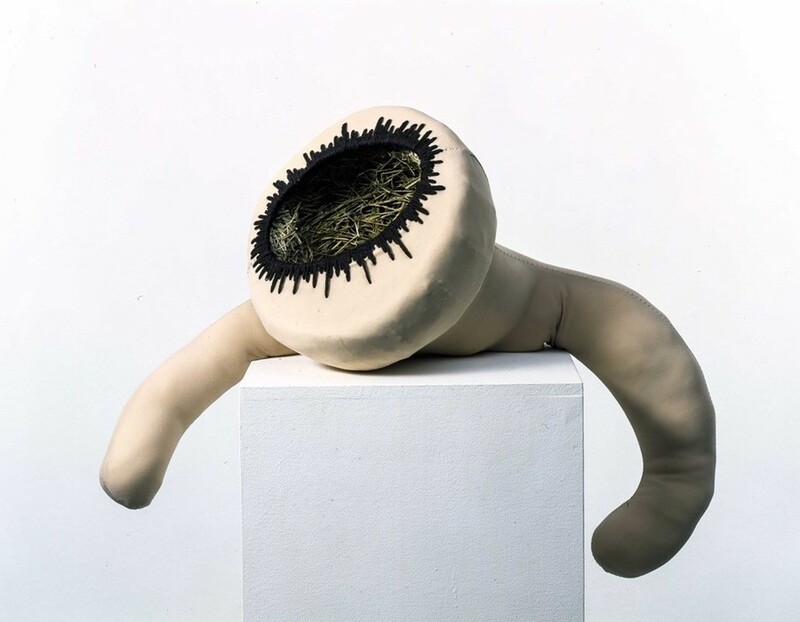 Her bulbous, curiously proportioned sculptures, for example, can be borne out of a single childhood memory, nostalgic scent or a piece of found text, but ultimately embody a 'character' or expression that resonates on a human level. Meanwhile, her meticulously edited videos are laden with Norse mythology and reoccurring symbolism, containing extravagant sets, dancers, and actors, yet an indefinable narrative, encouraging the audience to summon a plot of their very own. 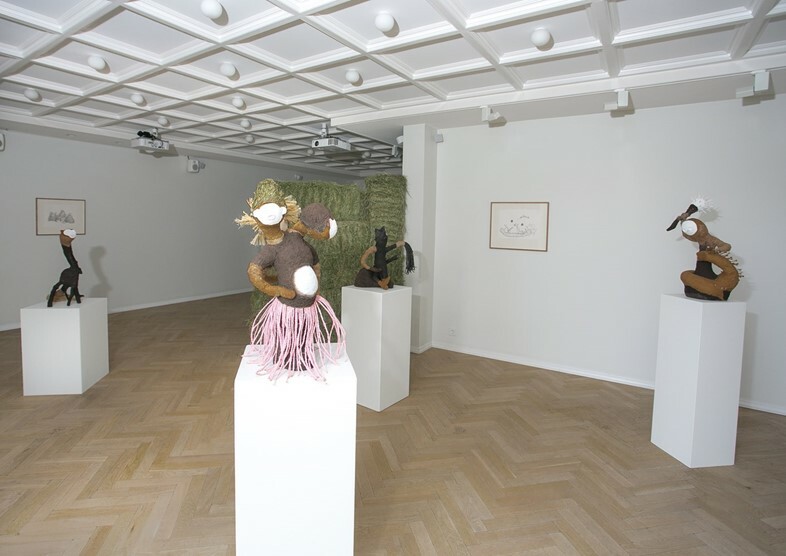 During her prosperous, almost three-decade strong career, Friðriksdóttir has staged and participated in exhibitions at esteemed institutions including the Museum of Contemporary Art Tokyo and the Royal Scottish Academy. Not forgetting her representation of her native country for the Venice Biennale in 2005, though she is still perhaps best known for her progressive collaborations with fellow Icelandic luminary (and coincidentally, her second cousin), Björk. Bound by their fearless expressionism, sensitivity and limitless imagination, Friðriksdóttir played a critical role in shaping the creative for both Björk’s epic Family Tree EP artwork and the film direction of the songsmith's conceptual music video Where’s the Line? (2005) Now, as a new collection of Friðriksdóttir's works go on display at the Reykjavik-based Gamma Gallery in a new solo exhibition entitled The Inner Life of a Hay Bale, AnOther speaks with the multihyphenate artist about her innermost thoughts, dreams and current creative motivations. What do you need in order to create art? A vast horizon, a knife, some string, a piece of wood, pencil and paper. A couple of friends or family coming over to my studio to share a fit of laughter or argue. And then, eventually, many hours of self-discipline to follow the ideas through. How do you like to work and why? I love to work in my studio. It is also my home, so it's easy to just let the work transform into time as it passes, to let time become work, without even thinking about it. Melding the morning coffee into the milk with some bread and butter, while listening to the news and feeling vulnerably human, makes me want to work. Sometimes I feel like a withered Christmas tree that has been discarded out on cold February streets, a fallen angel resting on top. Then, sometimes, I wonder if there is any work left to do in life, or indeed if life is still going on out there, beyond the walls of my studio and home. I’ll stealthily peek through the holes in the curtains to make sure, and most of the time someone will be starting a car on the corner, so I gather myself, keep on and work my way through the day. I love that melancholic feeling too, it spurs on my will to work. What inspires and motivates your creative practice at the moment? Death. I turned 45 years old on July 3, which means I’m halfway to ninety. It makes me wonder about life, what it is about, whether I will be dying soon, and what I need to do before then. Death is a carrot, and it seems to inspire me in many ways… like Mr. Rabbit in Alice in Wonderland, the timekeeper turns me on. Which artists (of past or present) do you most admire? [Czech filmmaker and artist] Jan Švankmajer, because of his endless ways in the impossible. Sergio Leone [Italian film director], for his aesthetics of death. And Björk, because she has what they have and is able to create beauty out of both. How does Iceland continue to inform and influence your work? Iceland is probably always on my mind. It will never let go of me, I will never be detached or entirely free of its influence. It holds me in its cold raven's claws, and I will never manage to escape its endless attachment. It keeps me going – it is torment, but I love it. What is your preferred medium right now and why? Pencil, clay, performance, contemporary dance and video. Nostalgia, melancholia and the daily mundane lay at the beginning of this journey. I had been working on a text, which took an unexpected U-turn and threw me back to the green fields of my youth, in the Valley of the Knives, in the West fjords. I just let it melt into that pot, and from there the piece just wrote itself, in a way, with some twist and turns. The smell of hay and the windy summers in that place opened up some drawers inside of me. I've used a lot of hay in my work through the years, and it has always had a place in my heart, but this time it totally swallowed my soul. The smell of hay and youth had me reverting to my old ways, drawing me back to the graphite pencils I favored as a child. This lead to the birth of some characters, which formed the foundation of an animated short called The Inner Life of a Hay Bale. The exhibition at the Gamma Gallery is all constructed around that animation, which I made in cooperation with Pierre-Alain Giraud, a filmmaker and a dear friend. Which of the 'characters' within the show can you most identify with and why? 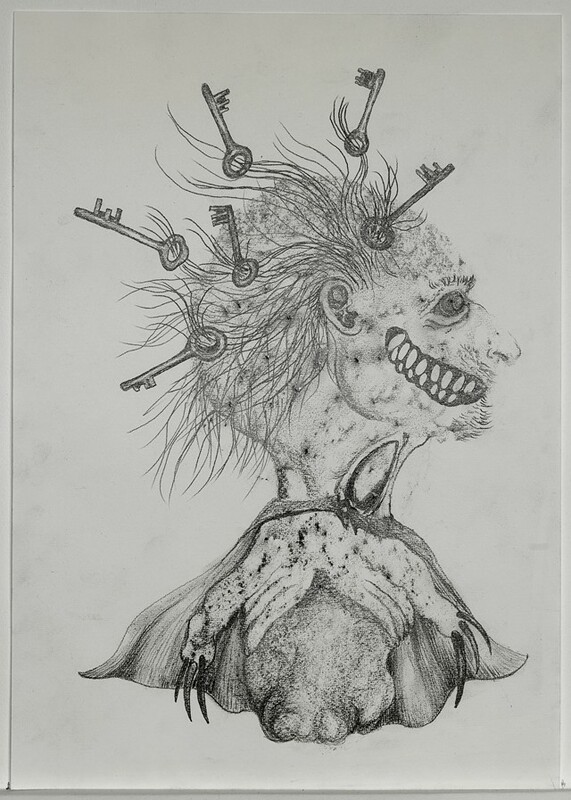 I identify very well with the characters in the drawings, and with the exhibition's sculptures, too, but I have to admit that there are a few drawn characters that I used for the animation that I connect with on a more absolute level, three in particular: The guy with the keys in his hair and a smirk on his face and a golden shimmering tooth, three paranoid hay stack guys and a portrait of a character with letters in his face, who is sailing on another guy that is eating some letters. They all just make me smile and that feels good. I've always found your work to be very transformative – is this your intention? If so, why? I think it is not an intention but I have the tendency to think in a transformative way, I believe in the metamorphosis of all… as a wise Zen teacher told me once: "No beginning, no end..." only endless metamorphosis. What do you consider to be your greatest artistic achievements to date and why? When I started to let go of things and started to let things flow in their natural way – when something snapped inside me a couple of years ago and I managed to take the art out of the way and began to enjoy life and its creative energy. The Inner Life of a Hay Bale by Gabríela Friðriksdóttir is on view at Gallery Gamma Iceland until August 27, 2016.